Tim Swiel will start at flyhalf for the Cell C Sharks when they face the Cheetahs in Bloemfontein this weekend. It was widely reported that Pat Lambie may have recovered from a bicep injury in time to be considered for this match, but it appears the Bok pivot will require at least an additional week out. Jake White has made a few interesting selections, chief amongst these the decision to finally give his reserve front row a start. Dale Chadwick’s elevation was expected, given Beast Mtawarira’s neck problem, but Kyle Cooper and Lourens Adriaanse will also take the field from the opening whistle this week, with Bok brothers Bismark and Jannie du Plessis playing off the bench. They are joined by exciting 19-year-old loose head Thomas du Toit, who was a stand out player at the recent IRB Junior World Championship. Anton Bresler returns to the team and starts alongside Stephan Lewies in the second row, with Jean Deysel also back in action, captaining the side from blind side flank. Willem Alberts and Tera Mtembu provide utility forward cover off the bench. Swiel’s selection at flyhalf means Frans Steyn can move back to his favoured position of inside center, where he’ll operate alongside S’bura Sithole. Cobus Reinach is at scrumhalf, while JP Pietersen, Lwazi Mvovo and SP Marais complete the starting backline. Fit-again wingers Odwa Ndungane and Tonderai Chavanga have both been picked on the bench, along with Charl McLeod. In fact, du Toit and Mtembu thus become the only two players on the bench not capped at test level. No Zeilinga But not a bad team at all. Plus 6 Boks on the bench. This looks like a very pacy team, moster the speed of the probably to counter the speed of the Cheetahs’ backline? Mmmm also a good side. If these two sides decide they want to play running rugby on Saturday this should be a cracking game. Sharks backline has some serious gas at its disposal. Nice mobile pack too. And with Bis and Willem lurking on the bench, we should have no problem countering their pack. Was Fred not available for selection – I understood he was already taking part in some club games? Sad that Lambie’s not ready, but otherwise a sensible team. Hopefully we will be so far ahead in the 2nd half that none of Bismarck, Jannie or Willem need to come on. Would also have had Paul Jordaan on the bench instead of either Odwa or Chavanga. No centre cover but two wings? Great side! I expect Frans to put in a monster performance to silence his critics. I always wonder what’s happened with players when they aren’t selected. So Lambie and Zeilinga I can assume is being left out to give them that extra week to recover – we don’t need to risk them now. But what about Paul Jordaan and Etienne Oosthuizen, have they been dropped out of the team, are they being rested, or did they pick up an injury that was never reported or I just din’t pick up when it was? Anyway, I like Steyntjie back at 12 and Swiel will still put in his best performance for the Sharks. I’m glad SP is getting a start again. It’s really great to see Anton back (before he leaves) and I’m also happy to see Willem is okay. And finaly Bissie and Jannie gets a rest, can’t wait to see our back-up front row giving it their all and Thomas du Toit getting his first SS cap. Awesome stuff, just so excited for this weekend and Sharks rugby to start again. Well, the obvious question is where is Jordaan and Zeilinga? I bit disappointed not to see Lambie, but rather have him fully recovered and ready for the Stormers next week, than risk him this weekend when he is not 100% yet. Glad for du Toit on the bench! Yoh not sure I’ve seen a more powerful bench. Happy to see Tonderai back in the mix. Pity about lambie but I’ve got no complaints about Tim. @Letgo (Comment 8) : Forgot about Oosthuizen! Wonder where he is? Who covers lock then on the bench? Alberts I suppose? Not really fair to him though. Yeah, would have loved to see Lambie at least on the bench, but I suspect his being careful. We wouldn’t want him to start playing again, just to tweak the same injury again and sit out the rest of the year. Also, I think the guys we have are good enough (if we don’t go into the games thinking the win will be a given and play our best) to win both these last two games. If Lambie, Zeilinga, Willem, Bissie, Jannie, Beast could or have to rest for the next two weeks, three (if we win both our games), then we will have our strongest squad, rested and ready for the last two and most important games. As good as Pollard was in that junior W/C there was one player that was as good as himanf that was Esterhuizen.This guy is the best centre we have had for years.I would have started him with Sibura, and Frans at 10 for this game and then to 15 when Pat comes back. Swiel needs experience at under21,lots of it before he can coomand a strting berth in Super rugby,Esterhuizen doesn’t and if we don’t give it to him he will walk. I really wish they would just quickly make mention of guys that have been left out. Keegan is also not there, but I guess that’s because we have all our loosies back. Still, just say where they are, and why which guys are playing. How did I miss Keegan? I completely understand what you’re saying, but I don’t think Esterhuizen will get anymore time this year than the 15min he got against the Bulls at Loftus. I think JW decided to give him a little more time after that game. What we need to do is make him our starting 12 for the CC. Well, him and Heimar, as I feel rotation is still best used during CC, where you can still win games and give plenty of players a shot to prove themselves for the next years SS season. We will have an excellent CC squad and if Esterhuizen stays, he could just be part of another special year for the Sharks and will soon be the starting SS 12 (as Frans Steyn doesn’t look like he’s staying in one place for two long). 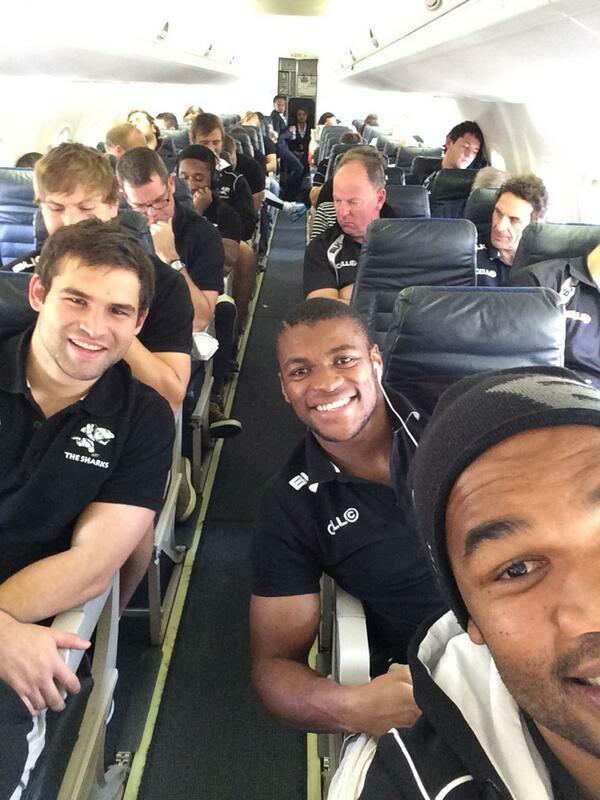 Reserves: Thomas du Toit, Danie Minnie, Monde Hadebe, Lock?, Flank?, Stefan Ungerer, Tim Swiel, Heimar Williams. Okay, so in the forwards we have a few places we could be a little thin, but still excited to see some youngsters coming through. @Letgo (Comment 20) : Yip…our CC team looks good! @Letgo (Comment 20) : Hold on, with this team you are implying no call-up for Adriaanse, Lewies, S’bu, Jordaan and even (dare I say!) Reinach? After all the noises made in that general direction over the last two weeks, I just assumed Lambie would NOT play this week. I’m more surprised to see Jordaan out of the match 23. JPP and even Odwa cover outside centre…but inside centre? Who’s covering that? Willem Alberts ? Does anybody know if Oosthuizen, Keegan, Esterhuizen, Zeilinga etc are playing against the Kings on Friday? What does the Sharks XV side look like? @jonnow (Comment 4) : “No centre cover but two wings?”…and one of our centres will be covering fly half if needed. We could be thin on a 12 here if Frans has to move one place down. They may be all called up at some point, but we already know they aren’t really part of HM’s first plan – only the backup plan. Would be glad if we don’t have many of them though, they all deserve a shot. And we will still be able to put a team together, give some more unknown guys a shot in CC. @Ossa (Comment 9) : that’s why it’s never a good idea to fall straight out of bed and immediately write an article! @Letgo (Comment 27) : Most should be in the squad though, and therefore not available for selection at the Sharks. But I do agree that it will give a few young guys the opportunity to prove themselves and in the process unearth a few jewels as well! Interesting selection, I share the concern about a back-up 10/12/13. Surely Paul Jordaan would have been a better choice on the bench since he has played 10,12,13 and wing in his career. Is he perhaps injured? If we lose either Swiel of Steyn early on we might get exposed. Excited to see Thomas du Toit on the bench. Hope he gets a little bit of game time. @vanmartin (Comment 33) : Yah. I’m also interested to see how lewis and sbura play now that they’ve had a taste of life in the bok camp and know that HM will be keeping a close eye on their performances. I think there will be a few big names in the Sharks XV. @Salmonoid the Subtle (Comment 26) : Obviously Jake has JP who he can shift to centre in case of injury, with Odwa or Chavanga coming on. You still gotta wonder why Jordaan isn’t there, called up to the Boks last week and dropped out of the match 23 by his franchise this week. @jonnow (Comment 38) : I’m more concerned with cover for 12. @jonnow (Comment 38) : Yes JP can move to centre but that will leave us with 2 retreaded wings playing centre and one of them at 12 for the first time. Curious. Any news yet on the Sharks XV? @SheldonK (Comment 43) : Yes – better to blood them both slowly. We will need both Pat and Fred to be fit for the playoffs. Swiel does not really inspire my confidence at this stage, and Frans is much better at 12. @bokbok (Comment 41) : Man, the Sharks communications and PRO have taken a dive in recent times. Lewies still has not being acknowledged and congratulated as a new Bok and no team announced for a game taking place tomorrow. Up your game Sharks. @SheldonK (Comment 43) : On another note apparently Jean Deysel was red carded in his club game last week. Can anyone confirm? @robdylan (Comment 46) : I have no doubt that you will run them down somewhere, sometime. @robdylan (Comment 51) : did it have anything to do with you bugging them? @The hound (Comment 15) : That is the biggest load of BS I have ever heard. Oosthuizen, like Serfontein before him is a hard as nails physical player and wait for it….keep waiting…nothing else!!! A typical South Africa centre who looks useless the minute anyone matches his physicality!!! Ma’a Nonu, apart from being a thug, is far more than just a hard runner – he has a good long pass, silky soft hands and has worked on his kicking (albeit still not that great). Option taking makes him better that Steyn, OOsthuizen and Serfontein!! Have watched him in a couple of matches,and yet to see him go into useless mode,probably because I have yet to see anyone match his physicality. @robdylan (Comment 58) : who’s that dude sitting behind Cobus? @robdylan (Comment 59) : Looks like Oosthuizen….is there a conspiracy doing the rounds? Wouldn’t there normally be a few players traveling with the team in case somebody dislocated an ankle in a freak accident 2 mins. before kick off? Suppose that’s where Ungerer would also be, as he’s not with the Sharks XV side. @FireTheLooser (Comment 60) : yeah look, one would expect a few traveling reserves. Probably Ungerer and Hadebe at least, although there isn’t enough evidence in that photo to confirm. Someone on another thread was asking about Big Ettas. We now know that he is definitely going to be in Bloem. Just need to see what role (if any) he ends up playing. Gotta agree: I really dont rate Oosthuizen as a centre. @robdylan (Comment 61) : So can I venture that he is bracketed with Alberts for the bench spot – or do you have to kill me if you tell me? @Big Fish (Comment 63) : OMG you guys won’t let me forget this one!! @Big Fish (Comment 63) : hey big boy. How was the birthday? Hola amigo. Was good. At my age, a chocolate digestive biscuit and a warm mug of horlicks to dip it in constitute happiness. @SheldonK (Comment 48) : don’t know if he was carded but I do think if it was true that he would not have been able to play for the Sharks tomorrow. @Big Fish (Comment 67) : and a glass next to the bed for the false teeth?!?!? !